Back To: WTF Is Music Publishing? Performance royalties are generated every time your copyrights are broadcast in public. The main areas I’ll cover now are radio, TV and gigs. Performance royalties are also generated when songs are played on jukeboxes, in cafes, restaurants, karaoke bars, doctors’ waiting rooms etc. Basically, if you hear music when you’re out and about then it’s generating cash for the people who wrote the song you’re listening to. Anywhere that wants to play music within their business has to pay the PRS for a license in order to do so, by law. Even if it’s in an office with just three people working in there; if they want the radio on in the background they have to have a PRS license. The basic rule of thumb to keep in mind throughout all this is; the more people who hear it, the more cash is generated. Here are some example figures of the kind of money which is generated when your music is played on the radio (as of Q3 2016). All the figures here are for a song four minutes in length, as these royalties are all based on the amount of airtime you receive. So if you’re doing two-minute punk songs then half all these numbers and if, perchance, you’re Meat Loaf reading this where all your songs are at least eight minutes then double them. And on a side note; I love you, Meat Loaf. Again, to stress the point above, the more people who hear it, the more money is generated. BBC Radio 2 has the highest number of listeners for any BBC station in the UK and that’s why you’re getting nearly double for a play by Graham Norton than as you are by Nick Grimshaw. Most regional BBC stations are worth between £2 and £5 per play, with BBC Radio London being worth £13 due to it obvious listenership size. All these monetary figures fluctuate and are amended every quarter using RAJAR data. RAJAR (RAdio Joint Audience Research) release listener figures for all the radio stations in the UK every few months. For example, you only used to get about £5 for being played on BBC 6Music, but ever since they threatened to shut that station down and its listenership increased significantly (they recently got their first million+ listener show in Steve Lamacq), the performance royalties of being featured there have notably jumped. Within the world of radio, you have two classifications of stations; census and sampled. All the larger radio stations (and indeed, all BBC channels) are census stations which means every single track which is played on there is reported to the PRS and therefore the songwriters will receive royalties for the broadcast. Currently, 93% of radio income is distributed via ‘census’ stations so it’s very much the lion’s share. A sampled station is a smaller station with a much lower audience share than a census station. So a local station in your area will probably be sampled around ninety days of the year. So, if one of your tracks gets played on one of those ninety days then you’ll receive royalties, if not, then you don’t. Now, this might sound a touch unfair, but it’s currently the best system we have. Firstly, you have to remember that the amount of royalties we’re talking about here for broadcasts on stations of this size are a matter of pence per play so you’re not missing out on much. Secondly, the PRS is a not-for-profit business. They collect all the income, take a percentage for the administration, and then pay out the rest to rights holders. In 2016 they analysed 4.3 trillion lines of data (an increase of 80% of the previous year) and if they then added to that already hefty workload by turning all small sampled stations into census stations then that would increase their overheads which would result in them needing to take a higher percentage admin fee which ultimately means less money is distributed to the writers and publishers. So it’s now you can start to see the true value of performance royalties just from radio alone. Every week the BBC publish their new playlists for the week which are split into A-list, B List and C List. If you’re on the A-list you’ll average around twenty-five plays per week, which for a four-minute track is £1,350 per week in gross performance royalties. And if you’re on BBC’s playlist then it’s highly likely you’ll be on the playlist of every other pop music station in the country. If you take a look at the airplay charts (which you can find in Music Week) you’ll see that big songs will have huge numbers of plays behind them; as I write this, I’ve picked up an old copy of Music Week from the summer just gone and Justin Timberlake’s Can’t Stop The Feeling clocked up 7,076 plays across 270 stations in a single week within the UK alone. That increases to 28,895 plays across 1,498 stations across Europe. With the vast majority of those plays generating a performance royalty when broadcast, that’s some serious publishing revenue right there. Above are the primetime per minute monetary values of some key channels within the UK (Q3 2016). Once again as you can see; the more people who see/hear it, the more money it generates in performance royalties and much like the radio stations, you also have ‘Sampled’ and ‘Census’ TV stations. These figures above are essentially one of three income streams you get from your music being broadcast on TV as this just covers the performance royalties. You also get mechanical royalties and PPL broadcast income, but I’ll come on to that further down the line when we discuss sync. 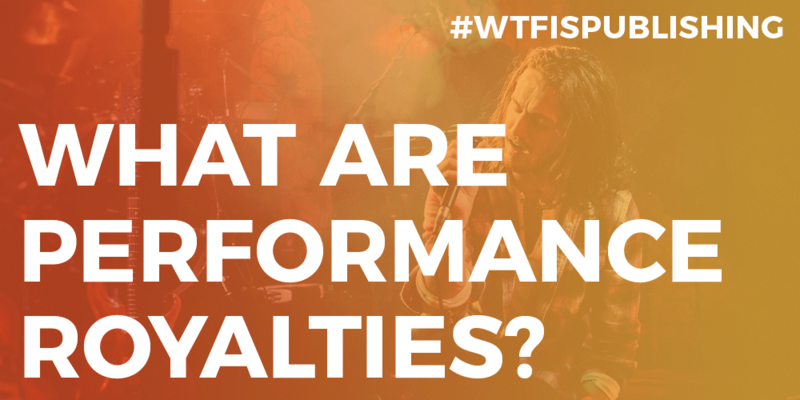 Live performance and ‘gig’ royalties are outrageously important. Around half of all income, we distribute at Sentric Music are for gig royalties and every single show you play generates performance income which you need to collect. The figures here are all examples of the average amount of performance royalties Sentric has collected for artists who use our service in the past. To stress; all the money mentioned above are performance royalties alone and they have nothing to do with the income you’ll get from the promoter/venue for playing the gig or from ticket sales etc. Within the world of live royalties, you have two main categories; ‘Gigs & Clubs’ and ‘Major Live Events’. – Then the PRS will take £5 from that initial license fee and pay it to you, the songwriter, and your publisher. So to stress one more time; the venue/promoter isn’t paying you this directly and you’re not upsetting anyone by claiming these royalties which are rightfully yours. In the past I’ve had artists say to me; “we’ll stop getting gigs if you go around pestering them for money”, and, as I just hopefully explained, that simply isn’t the case. Currently, the major live event tariff is 3% of the gross ticket sales. So if you play a 1,000 capacity venue which sells out at £10 per ticket then £10,000 is generated. 3% of that (£300) is then split between the songwriters of the songs performed that night, weighted in favour of the headliners. As you can see, there is some really significant income to be collected out there, and depending on the kind of gigs you’ve been playing (and in which territories) it’s sometimes possible to go back six-to-twelve months in the past and collect your royalties for those as well. We have an entire team at Sentric whose sole jobs are to make sure that all these gig performance royalties make their way to the artists that use Sentric’s service and they’re rather incredible at what they do. How about another real life example? We look after an artist who was asked to support a well-known British indie band on a month-long tour around the UK in venues circa the 2,000 capacity mark. They were offered £50 a night to cover their petrol and food so they did it knowing they’d lose money overall but decided it was worth it in a bid to sell copies of their album and make new fans. Half a year later (it can take six-twelve months for gigging income to come through) they brought home £4.5k in performance royalties alone which were more than they’d ever generated through any other income stream before including record sales. And another? Years ago we had an artist win a competition to support Bon Jovi at a football stadium. They did a quick 20-minute set early on in the evening and they bagged £8,000+ in performance royalties. That’s nice eh? So consider the fact that if they received that much for twenty minutes, Bon Jovi would have pocketed £72k for their three hours on stage. And that’s per gig on a worldwide stadium tour. Basically, as soon as you’ve finished reading this post go and write the next Livin’ On A Prayer. NEXT: What Are Mechanical Royalties?